Have to tell you all, I got a new desk for under $35. I had a little corner desk for my computer and there just wasn’t enough room on it. Things kept falling off behind it and it was a pain to retrieve them. So I thought I’d go looking for a desk. Desks are expensive! OMG! I did not want to spend $300+ for a desk to fit in the corner. Anyway, we went to several places and finally ended up at Office Max. Surprise they were having a going out of business sale! (at least this particular branch). All the desks they had were way too large. 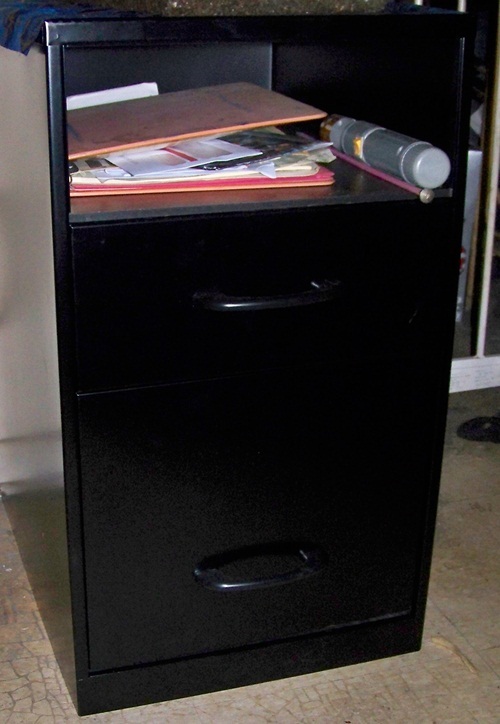 So we got to looking around and found some filing cabinets. They were originally $60 each, but on sale for $25 each. Hubby said he could make a top as we had some unused plywood and he could cut it and then paint it to match the cabinets. So I told the sailes person I wanted two, thinking I would have to spend $50 for the pair. But when we got to the cashier, they were an additional 40% off. Yipeeeeee!! I got them for $15 each + tax. Went to WalMart and got some spray paint for $0.93 a can (got 2 just in case). So now I have a new desk that measures 18 inches deep and 48 inches long and fits in that corner nicely. 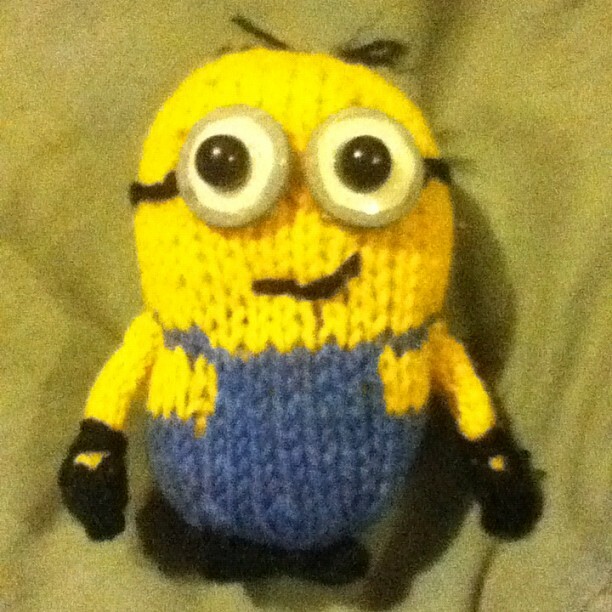 I was browsing through Ravelry’s pattern base and came across a pattern for a knitted minion. There were several for crocheted ones too. Anyway my youngest son saw it and wanted one. Yesterday, I went through my stash and gathered my yellow wool yarn and denim blue wool yarn. Then I located my fiberfill, some buttons and glue. Then I pulled up the pattern and began knitting the little guy. It took very little yarn and only a few hours to complete. I began thinking…not usually a good idea for me. But, wouldn’t it be great if we all had minions to do our housecleaning, grocery shopping, yard work etc. Now where is that Minions, Inc. so I can get me a few minions. I would certainly have more time to craft.